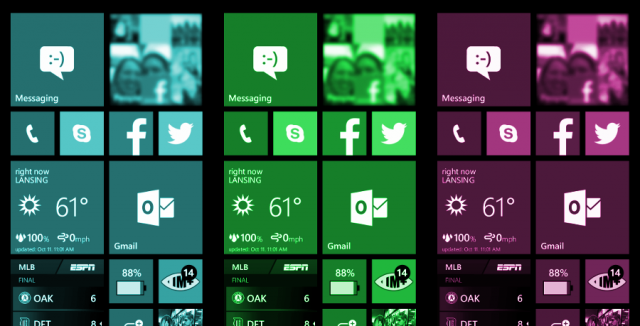 Show us your Windows Phone Start Screen! If there is one thing that users of smartphones love to do its customization. Android is full of icon packs and custom launchers, and iOS has a thriving jailbreaking community creating custom themes. Windows Phone has a lot of customization built right in to the OS, but there is also some you can do on your own, and with the help of certain apps. Today we’d like to see how our readers set-up their Start Screens! In the comments you can attach an image with the button highlighted below. If there is any special app you have used to create your look be sure to mention it. If you lack inspiration the websites MyTil.es is a great place to see other Start Screen set-ups. Show us what you got! What did you use for the custom icons? That awesome which app did you use to make the smaller icons? I change my layout about once a month. Wish they have 2 by 1 and 4 and 1 tiles also. I think 4 by 2 large tile is a bit big. Oooh I really like that color combination. The blue one looks kinda cool, but that’s thing I really don’t like about the new Windows Phone or Windows 8 start is you can’t have a background image. That just seems standard to have yet they don’t have it. Looks real good, which app you use for the time tile? thanks! Congrats on a very cool look. Excelent. I love it!! How you got Tile Tile? I think the time tile is called t:me me. looks great! I like the grey too! why your phone time says it’s 9:04 but your tile time says 8:20? Can’t find any app even close to this name? Anyone find this? when i saw the ‘Header Tiles’ app, i thought about doing something different, and that it’d help me.. when i was done with that, i heard about the ‘wiztiles’ and thought i could hang up a pic on my start screen.. so i used the joker.. but actually there is another poster with the batman on the back side of tile, which flips and makes it beautiful.. and for the connectivity shortcuts, i used the ‘cool tiles’.. i don’t know guys, does it look good? You should have added “Data Sense” also. It would show people how can they keep an eye upon their data uses, if they are not on unlimited plan. BTW, Awesome look.